Sometimes anxiety is easy to identify—like when a child is feeling nervous before a test. Other times anxiety in the classroom can look like something else entirely—an upset stomach, disruptive or angry behavior, ADHD, or even a learning disorder. There are many different kinds of anxiety, which is one of the reasons it can be hard to detect in the classroom. What they all have in common, says neurologist and former teacher Ken Schuster, PsyD, is that anxiety "tends to lock up the brain," making school hard for anxious kids. Separation anxiety: When children are worried about being separated from caregivers. These kids can have a hard time at school drop-offs and throughout the day. 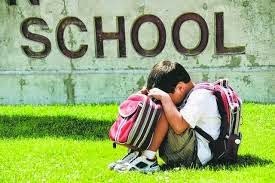 Social anxiety: When children are excessively self-conscious, making it difficult for them to participate in class and socialize with peers. Selective mutism: When children have a hard time speaking in some settings, like at school around the teacher. Generalized anxiety: When children worry about a wide variety of everyday things. Kids with generalized anxiety often worry particularly about school performance and can struggle with perfectionism. Obsessive-compulsive disorder: When children's minds are filled with unwanted and stressful thoughts. Kids with OCD try to alleviate their anxiety by performing compulsive rituals like counting or washing their hands. Specific phobias: When children have an excessive and irrational fear of particular things, like being afraid of animals or storms. Here are some tips for recognizing anxiety in kids at school, and what might be causing it. When a child is squirming in his seat and not paying attention, we tend to think of ADHD, but anxiety could also be the cause. When kids are anxious in the classroom, they might have a hard time focusing on the lesson and ignoring the worried thoughts overtaking their brains. "Some kids might appear really 'on' at one point but then they can suddenly drift away, depending on what they're feeling anxious about," says Dr. Schuster. "That looks like inattention, and it is, but it's triggered by anxiety." It might look like truancy, but for kids for whom school is a big source of anxiety, refusing to go to school is also pretty common. School refusal rates tend to be higher after vacations or sick days, because kids have a harder time coming back after a few days away. Going to school can also be a problem for kids who have trouble separating from their parents. Some amount of separation anxiety is normal, but when kids don't adjust to separation over time and their anxiety makes going to school difficult or even impossible, it becomes a real problem. Kids with separation anxiety may also feel compelled to use their phones throughout the day to check in with their parents. Acting out is another thing we might not associate with anxiety. But when a student is compulsively kicking the chair of the kid in front of him, or throws a tantrum whenever the schedule is ignored or a classmate isn't following the rules, anxiety may well be the cause. Similarly, kids who are feeling anxious might ask a lot of questions, including repetitive ones, because they are feeling worried and want reassurance. Anxiety can also make kids aggressive. When children are feeling upset or threatened and don't know how to handle their feelings, their fight or flight response to protect themselves can kick in—and some kids are more likely to fight. They might attack another child or a teacher, throw things, or push over a desk because they're feeling out of control. Sometimes kids will do perfectly well on tests and homework, but when they're called on in class teachers hit a wall. There are several different reasons why this might happen. "Back when I was teaching, I would notice that when I had to call on someone, or had to figure out who's turn it was to speak, it was like the anxious kid always tended to disappear," says Dr. Schuster. "The eager child is making eye contact, they're giving you some kind of physical presence in the room like 'Call on me, call on me!'" But, when kids are anxious about answering questions in class, "they're going to break eye contact, they might look down, they might start writing something even though they're not really writing something. They're trying to break the connection with the teacher in order to avoid what's making them feel anxious." If they do get called on, sometimes kids get so anxious that they freeze. They might have been paying attention to the lesson and they might even know the answer, but when they're called on their anxiety level becomes so heightened that they can't respond. Anxiety can manifest in physical complaints, too. If a student is having unexplained headaches, nausea, stomachaches, or even vomiting, those could be symptoms of anxiety. So can a racing heart, sweaty palms, tense muscles, and being out of breath. When a child starts doubting her abilities in a subject, anxiety can become a factor that gets in the way of her learning or showing what she knows. Sometimes this can be mistaken for a learning disorder when it's really just anxiety. However anxiety can also go hand in hand with learning disorders. When kids start noticing that something is harder for them than the other kids, and that they are falling behind, they can understandably get anxious. The period before a learning disorder is diagnosed can be particularly stressful for kids. When a student doesn't turn in her homework, it could be because she didn't do it, but it could also be because she is worried that it isn't good enough. Likewise, anxiety can lead to second guessing—an anxious child might erase his work over and over until there's a hole in the paper—and spending so much time on something that it never gets finished. We tend to think of perfectionism as a good thing, but when children are overly self-critical it can sabotage even the things they are trying their hardest at, like school work. You might also notice that some anxious kids will start worrying about tests much earlier than their classmates and may begin dreading certain assignments, subjects, or even school itself. Some kids will avoid or even refuse to participate in the things that make them anxious. This includes obvious anxiety triggers like giving presentations, but also things like gym class, eating in the cafeteria, and doing group work. When kids start skipping things it might look to their teachers and peers like they are uninterested or underachieving, but the opposite might be true. Sometimes kids avoid things because they are afraid of making a mistake or being judged. Dr. Schuster notes that when kids get anxious in social situations, sometimes they have a much easier time showing what they know when teachers engage them one-to-one, away from the group. Is That Love or Fear? Can Fish Oil Help Boys With ADHD Pay Attention?